his interesting surname is of English locational origin from one of the places called Harthill in Cheshire, recorded as "Herthil" in the 1259 Court Rolls; in Derbyshire, recorded as "Hortil" in the Domesday Book of 1086; and in the West Riding of Yorkshire, recorded as "Hertil" in the Domesday Book. The placename derives from the Old English pre 7th Century "heorot" meaning hart or stag plus "hyll" a hill; hence "hill frequented by stags". The surname is first recorded in the latter half of the 12th Century (see below). 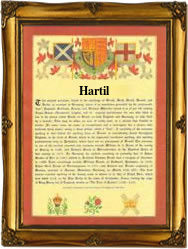 In the modern idiom the surname has many variant spellings including Hartle, Hartell, Hartles, etc.. Recordings of the surname from the London church registers include; Richard Harthill, who married Elyn Ledson, on September 28th 1544, at St. Michael Bassinshaw; Nathan, son of Robert Hardall, was christened on May 14th 1564, at St. Michael Cornhill; the marriage of Edward Hartill and Mary Stubins took place in St. James Dukes place, on May 29th 1683; and William Hartill married Elizabeth Dewberry on July 20th 1697, at St. Giles Cripplegate. The first recorded spelling of the family name is shown to be that of Robert de Herthil, which was dated 1176, in the Pipe Rolls of Derbyshire, during the reign of King Henry 11, known as the Builder of Churches, 1154 - 1189. Surnames became necessary when governments introduced personal taxation. In England this was known as Poll Tax. Throughout the centuries, surnames in every country have continued to "develop" often leading to astonishing variants of the original spelling.